Go Beyond the Edge of the World! What’s beyond the Auroral Ocean? Where did the human conquerors come from? Is there anything north of the Desolation? What awaits those who set sail across the Nyxian? The answers to these questions and more are contained inside this expansion to the world of Shadow of the Demon Lord. Each chapter goes beyond the edge of the map, offering a plethora of strange places inhabited by stranger denizens that characters might befriend or overcome. 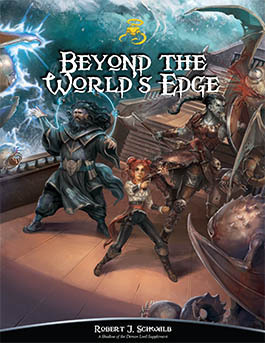 Loaded with adventure ideas and new creatures, this book will inspire Game Masters to take their campaigns Beyond the World’s Edge! Or buy it in print here!